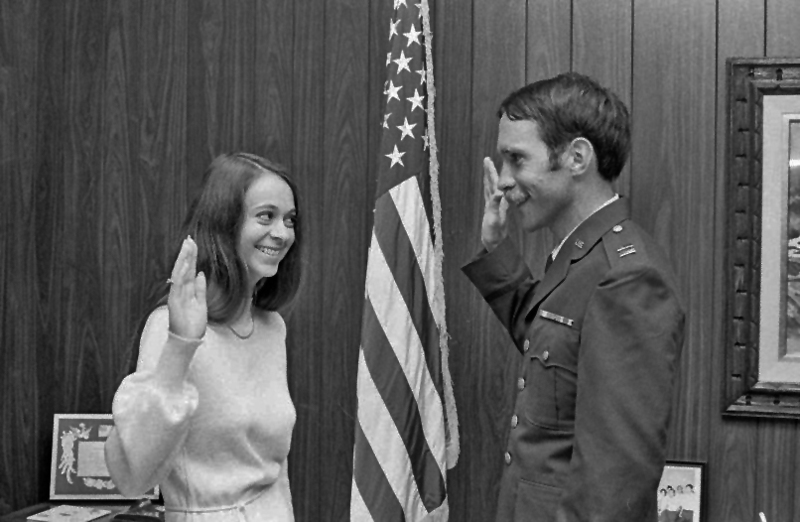 The photograph above shows Kathleen Berg being sworn in by her husband Stephen Berg. The date is in early 1977 because she was commissioned in August 1977. The future general first served with the then 201st Combat Communications Group on Hickam AFB. Her first assignment was as the Group’s public affairs officer. Her complete official military biography: Brigadier General Kathleen F. Berg. The general was a Traditional Guardmember her entire career. In her civilian life, she holds a doctorate in educational psychology and served in a variety of positions at the University of Hawaii, Manoa’s College of Education over a 40-year career. Her university biography: MIC3 Brig Gen Berg Bio 2015. Stephen Berg came off active duty and also served in the 201 CCG. He later transferred to the 169th Aircraft Control & Warning Squadron. A retired AGR, he also holds a doctorate and taught mathematics at Hawaii Pacific University for many years. Special thanks to Stephen Lum who digitized this photograph from a black and white negative.